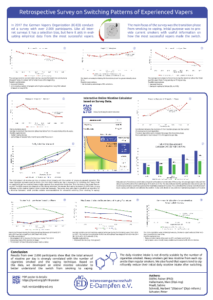 Global Forum on Nicotine (GFN) 2018 Poster - Interessengemeinschaft E-Dampfen e.V. An increasing percentage of DL switchers. 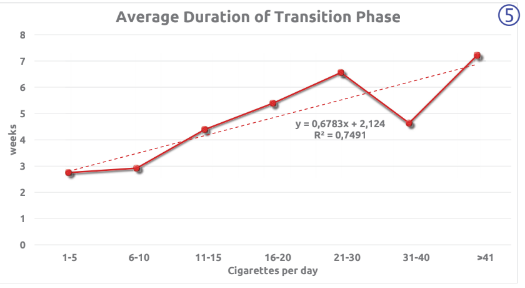 Correlation between the duration of the transition phase and the number of previously smoked cigarettes. 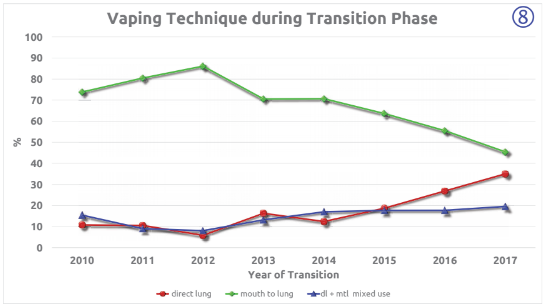 The more cigarettes were smoked, the longer the transition phase. Most participants had smoked 11 to 40 cigarettes per day. 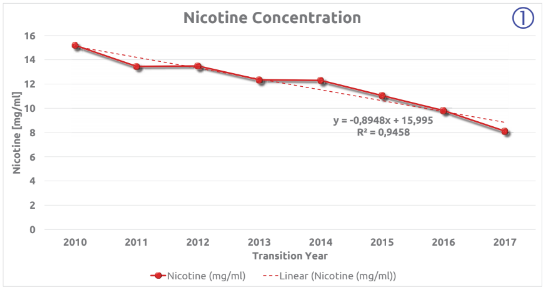 Since the purpose of the nicotine calculator is to calculate a reasonable suggestion for current smokers on what nicotine strength to select when starting, we used only the data from those vapers who switched after 2014. Before that date the available hardware was rather inferior to current products and thus the experience of vapers switching back then isn't applicable for smokers switching today. 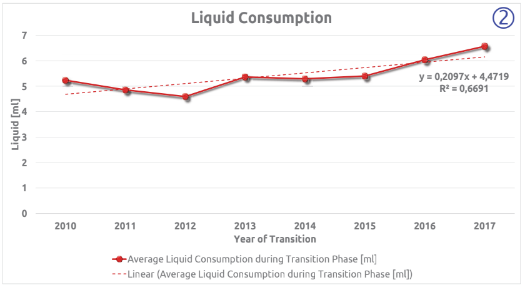 The total amount of nicotine per day correlates almost linearly with the number of previously smoked cigarettes. The more cigarettes someone used to smoke, the more total nicotine per day is necessary for switching. But heavy smokers apparently get less nicotine from a single cigarette than people who smoke less. Thus the slope is less steep than expected. The total amount also depends on the vaping technique. We assume that vaping technique (DL/MTL) has a strong influence on the nicotine kinetics. More studies are necessary. 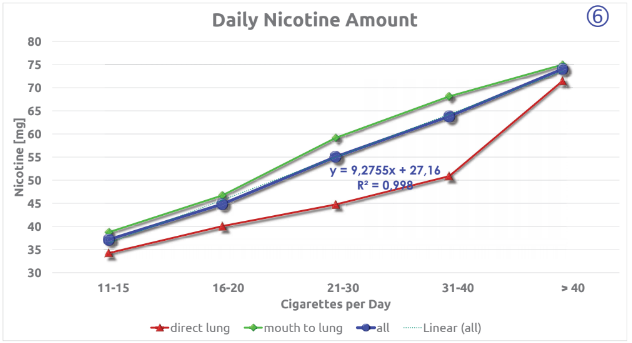 The survey data were used to establish an algorithm for a Nicotine Calculator, which provides reliable recommendations for successful switching (from smoking to vaping). 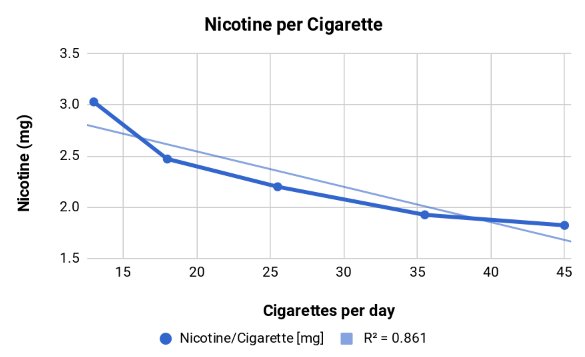 This calculation clarifies the interesting conclusion that heavier smokers seem to get less nicotine from each cigarette. 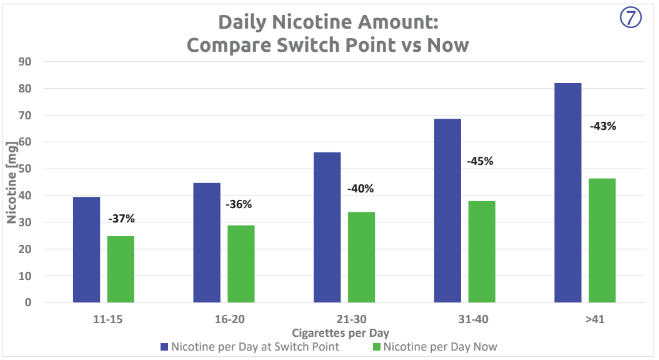 Daily amount of nicotine at switch time compared to the amount at the time of the survey. 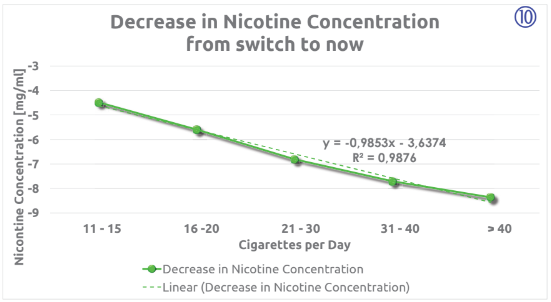 On average vapers reduced their daily amount of nicotine after switching by 40 % (36 % to 45 %). 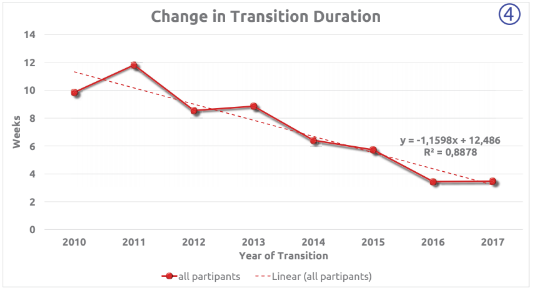 The data indicate that the participants reduced not just the nicotine concentration over time, but also their total daily amount of nicotine. This contradicts the common claim that switching to vaping just replaces one addiction by another. It also casts doubt on any addiction maintaining property of nicotine. Results from over 2.000 participants show that the total amount of nicotine per day is strongly correlated with the number of cigarettes smoked and the vaping technique. 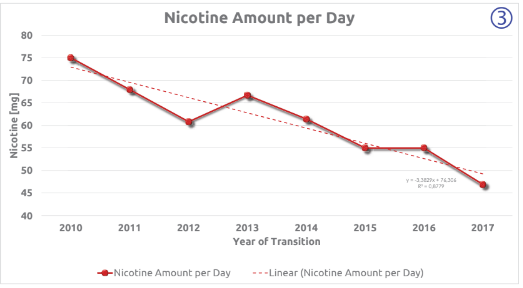 Based on this data, we developed an online nicotine calculator to better understand the switch from smoking to vaping. The daily nicotine intake is not directly scaleable by the number of cigarettes smoked. Heavy smokers get less nicotine from each cigarette than regular smokers. We also found that vapers tend to significantly reduce their initial daily nicotine intake after switching. Vielen Dank für diese Infos. Für mich ist das eine gute Orientierungshilfe bezügl. durchschnittlichem Nikotinbedarf, Umstiegsdauer, usw . Ich bin gerade beim Umstieg – von 40+ Zigaretten (43 Jahre lang) zu aktuell zwischen 5-7 – nach einigen Wochen dampfen. Ich hatte allerdings massive Probleme mit den Liquids (zu süss, scharf, Gefühl von Belag im Rachen, zu wenig Nikotin, 4 mg/ml, weil meine Lunge bei mehr als max. 5 mg/ml streikt). Inzwischen habe ich zumindest 1 Liquid gefunden und seither geht’s voran… Als Österreicherin gibt’s auch noch ein paar andere Probleme (Versandhandelverbot). Ich bin Mitglied beim österreichischen Dampferclub, OECD (nachdem ich einen entsprechenden Hinweis von Philgood in einem seiner Videos sah).